Announced at IFA 2017, Neato’s Botvac D7 robot vacuum cleaner has the ability to map your home as it vacuums, allowing you to give it specific instructions about where it should clean. You have a couple of options as to how it generates this map. It can either chart the territory throughout its maiden cleaning voyage, or else you can put it into ‘discovery mode’ which won’t risk it vacuuming areas that you’ll later set as no-go areas. You use the app to set these locations, and it will also report any obstructions the vacuum cleaner encountered, so you know where it hasn't been able to clean. iRobot has included similar functionality in its Roomba line in the past, although this has relied upon you physically placing battery-powered sensors throughout your home to tell the robot to not enter certain areas. 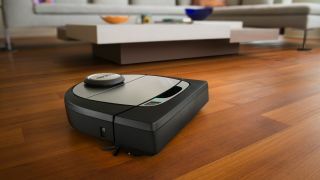 This isn’t the first time a robot vacuum cleaner has mapped a home as it cleans, but in the past it’s proved slightly controversial. iRobot CEO Colin Angle suggested that the company would be willing to sell these floorplans to other smart home companies, but later appeared to step back from the position. Importantly, Neato’s mapping efforts appear to be focussed around giving users more control over their vacuum cleaner’s path rather than to sell this data to third-parties. The vacuum cleaner will also integrate with all major smart home ecosystems, including Amazon Alexa, Google Home, and IFTTT. There’s also a Neato Facebook Messenger Chatbot if you’re into that sort of thing. No firm release date for the Botvac D7 has been released beyond ‘Q4 2017’, but when it’s available it’s set to cost $799 (around £617 / AU$1000).